The papers presented raise important issues for serious consideration by policy makers and citizens. In order for the issues to have wider access, it is recommended that they be edited and published. Prof. Kimani Njogu and Dr. Sabelo Ndlovu are mandated to coordinate the editing process with Mr. Peter Kuria. The issues discussed are topical and urgent for citizens of Eastern Africa and ought to be raised in the region. It is recommended that a follow up Seminar be held in Eastern Africa in 2009 in order to interact with the political class and civil society actors in the region. Issues of ethnicity, land, human rights and conflict are of interest at the World Social Forum. It is recommended that KIOS and Shalin explore how panelists can participate and present their papers at various this and other forums to further mobilisation. Conflicts facing different parts of Africa are closely tied to lack of justice, infringement of citizen’s rights, limited resources, freedom and democracy. It is recommended that the spirit of an pan-African identity be strengthened through networks and alliances. The African diaspora should uphold the respect of human rights and take an interest in reducing conflict on the continent. Citizens in the diaspora can be core to the consolidation of a pan-African identity. 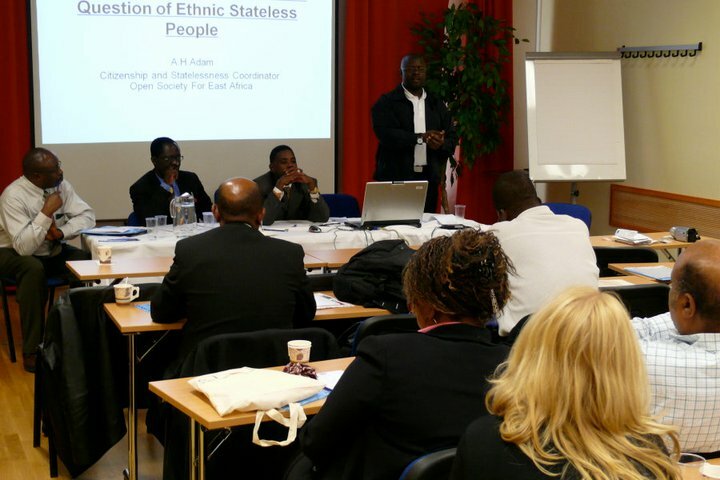 There are stateless citizens in Africa. It is recommended that the right to citizenship be taken up as a human rights issue and that the space for social integration be expanded among all citizens. In situations of conflict, the rights of internally displaced persons are violated. There rights should be protected through international conventions and statutes. In order to address conflict in Africa, it is imperative that their root causes be examined and resolved. The architecture of governance and Electoral processes that are designed in a Winner-Take-All format limit the participation of citizens in national and local decision making processes. More innovative and inclusive approaches in governance should be explored in order to cater for varied interests. Truth, Justice and Reconciliation Commissions are contributing in national healing and the consolidation of democracy. These processes should however not be designed to give blanket amnesty to violators of human rights. Impunity breeds more conflict. The quality of political leadership in Africa is uninspiring due to its lack of commitment to genuinely transforming the lives of ordinary citizens. By developing a new cadre of leaders within and without the political sphere, the continent can realize true change. It is recommended that organizations doing leadership work be provided with resources to undertake the nurturing of an alternative leadership. There is no doubt that media have contributed to the expansion of democratic space in Eastern Africa since the 1990s at the liberalization of the airwaves. Media freedom is imperative and should be protected at all times but freedom must go with responsibility if the sector is to contribute to democratization and the protection of the rights of all citizens. It is recommended that capacity of media be enhanced through professionalism and entrenchment of ethical standards. Training of talk show hosts, interviewers and political reporters and editors ought to be prioritized. Community media is a model for the future in Africa. It is key to the growth of a democratic culture, the strengthening of institutions of governance and the ability of citizens to hold leaders to account. But community media requires strategic and engagement in terms of policy, funding and sustainability. Equally, the growth of independent national broadcasters is key for linking citizens with government. It is recommended that community media and independent national broadcasters be supported. Aggressors and victims of ethnically motivated violence remain un-rehabilitated and engrossed in the politics of grievance, resentment and revenge. Aggressors are not seeking forgiveness. It is recommended that in post conflict reconstruction, transitional justice and national healing be prioritized.